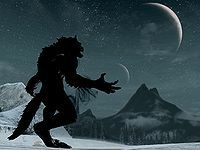 This article is about the condition lycanthropy, in particular the effects it has on the player. For enemies and NPCs who are werewolves, see Werewolf. Lycanthropy is a condition in Skyrim that gives you the Beast Form greater power, which allows you to take on the form of a werewolf. Becoming a werewolf adds the Beast Blood constant effect, which grants a 100% resistance to all diseases, but also prevents you from gaining resting bonuses. Werewolves can deal lethal damage with their claw attacks, move swiftly, and have increased health and stamina. The only way to become a werewolf is to drink werewolf blood during The Companions questline. In the Dawnguard add-on, a skill tree is added for werewolves, with perks that will increase your damage, health, and stamina as a werewolf, and even enhance your howl abilities. In order to unlock new perks, you must feed on corpses of non-undead NPCs. As a werewolf, you can also draw power from the Totems of Hircine to give your shout-like "howl" ability new powers, although you may only use the shout related to the particular totem you have activated. The Beast Form greater power can be used once per day to transform into a werewolf for 150 seconds. You can keep Beast Form active longer by feeding on humanoid corpses (with the Savage Feeding perk, you can feed on almost any dead creature). Every feeding restores 50 points of health and adds an additional 30 seconds of time in Beast Form. The Ring of Hircine provides an alternate unlimited means of transformation for werewolves. Your health increases by 50 and stamina increases by 100 (with a Dawnguard added perk, health increases by 150 and stamina by 200). Stamina regeneration increases from 5% of your total stamina per second to 20%. Carrying capacity increases by 2000 points. Howl of Terror: enemies flee in fear for 60 seconds and nearby wolves come to your aid. Totem of Brotherhood: summons two red pack members to aid you in combat for a limited time. Totem of The Hunt: reveals nearby prey, similar to a Detect Life spell. Totem of Fear: grants a higher-level fear shout. Base unarmed damage increases to 20 points and reach to 150 points (most races have a base unarmed damage of 4 and a reach of 96). Werewolf Claws: a constant Fortify Unarmed Damage effect that increases with your level (and gives you Resist Damage if Dawnguard is installed)—see table. Base health regeneration is set to 0 (unless the Ring of the HuntDB is equipped). The first time you transform using Beast Form, you will immediately be cured of all diseases, including any stage of vampirism. This means you cannot be a vampire and a werewolf at the same time. The Beast Form power also automatically removes all of your equipment. Summoned thralls, such as dead thralls, will immediately die. However, other summoned creatures will remain until their timer expires. While you are in beast form, you cannot use any of your equipment, spells, dragon shouts, or powers, but your attacks increase in power and speed, and you may execute one of four "kill cam" moves. Pressing a single attack button may have you leaping on your enemy and savagely slashing their chests, or biting their throats. Pressing both attack buttons simultaneously may have you throwing your enemy a great distance, or lifting them off their feet and decapitating them. Your move speed will increase as well, and you will not be staggered by attacks or by attacking an enemy with a raised shield. Since you cannot use spells or items, the only way to heal yourself is to feed on corpses. Racial abilities do not carry over into your beast form, but existing spell effects do. This includes passive abilities such as The Lord Stone, the Blessing of Mara, and the Magic Resistance perks from the Alteration skill tree. It also includes the Destruction Cloak spells and the Alteration Flesh spells. However, effects that change health regeneration rates, such as The Lady Stone or Regenerate Health potions, will do nothing unless you have equipped the Ring of the HuntDB. This is because werewolves that are not wearing this ring have their base health regeneration set to 0 points, so any effect that multiplies this rate will result in a health regeneration rate of 0. 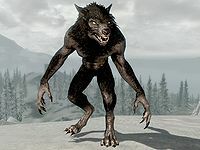 As a werewolf in Skyrim, you will be hated and feared by almost any NPC that sees you in your beast form, and most will attack you on sight (exceptions include other werewolves, M'aiq the Liar, members of the Dark Brotherhood, The Circle, followers currently in your service, members of the Thieves Guild, and the heroes of Sovngarde, but not your spouse, unless your spouse is one of these). Your wolf cousins will not attack you, and may even come to your aid if you use your Howl of Terror ability. Crimes committed in beast form will not be attributed to you and will not increase your bounty, unless someone sees you transform. If you are seen turning into your beast form, 1000 gold will be added to your bounty (unless the person is one of those that won't attack you). You will have a forced third-person view while Beast Form is active and will not be able to access character menus or maps. If Dawnguard is installed, opening the character menu will open the Werewolf skill tree. You will not be able to pick up any items, pick locks, activate containers, or initiate conversation while in beast form, but you can activate switches (such as levers and pull chains) to progress through dungeons (though you will be unable to interact with objects preventing the use of switches, e.g. the bones or scraps that must be removed to use certain switches in Raldbthar Deep Market). You can command followers by pointing your crosshair at them and holding down your activate/use control. Followers cannot be commanded to pick up items while you are in beast form, however—they will interpret any such order as simply "move there". You cannot consciously choose to deactivate Beast Form once you have transformed. The only way to return to your human form is to wait for the Beast Form to end or to use the "wait" function. In Skyrim Special Edition, anything you had equipped while transforming is automatically re-equipped. In the original release, you have to re-equip your equipment manually. All howls except for Howl of Terror have to be unlocked via a quest that is available when you have completed the Companions questline, as long as you remain a werewolf. You can only have one howl active at a time. You can choose which howl you wish to select by visiting the Underforge and praying at the totem that corresponds to the howl you want. Only three totems are available; once you have selected a new howl by praying at a totem, the Howl of Terror becomes permanently unavailable, although the Howl of Fear, which is available from the third totem, is very similar. The Dawnguard add-on adds a perk tree for werewolves. The skill tree is simply called "Werewolf" and perks are earned through feeding on the corpses of fallen NPCs (or creatures after the Savage Feeding perk has been unlocked). It is not necessary to feed on fresh kills—you can also feed on bodies that are already dead. Opening the character menu while transformed will instead open this skill tree. The totem-related perks will only apply if you currently have the respective totem active. Unlike the Vampire Lord, you cannot change your shout power while transformed. Acquiring new perks requires more feedings each time. The first perk requires five feedings; after that, each new perk requires two more feedings than the last (up to 25 required to progress from the 10th perk to the 11th). You will need to feed a total of 165 times to complete the entire tree. To cure yourself in the base game, you must complete the Companions quest line. Immediately after you have completed Glory of the Dead, you may cure yourself of lycanthropy, although you will need another Glenmoril Witch's head. Once you return to Jorrvaskr, you must wait until both Vilkas and Farkas (separately) ask for help to be cleansed of lycanthropy, and the quest Purity is completed twice. Then you can use the Flame of the Harbinger to cure yourself. Once cured you will no longer have access to the Underforge, and you will not be able to complete the Totems of Hircine quests if you have not already done so. You will also be unable to complete the Dragonborn quest Visit the hunters at Frostmoon Crag. The Dawnguard add-on allows you to restore your lycanthropy with help from Aela the Huntress. You can do this only once; if you cure it again, you cannot regain your lycanthropy from Aela. If you restore your lycanthropy, you will keep all of the werewolf perks you had before, and will also keep the same totem benefit that you had active when you were a werewolf previously. Accepting Lord Harkon's gift of vampirism during the Awakening quest or asking Serana to make you a vampire (either during the Chasing Echoes quest or after the end of the Dawnguard questline) will also cure you of lycanthropy. There are 11 available perks, so all of the werewolf perks must be unlocked for this achievement. Several other achievements are obtained from the Companions questline. You will have 0 base armor while in beast form, but you do count as unarmored for the purposes of the Mage Armor perk. Before patch 1.3.10, armor rating in beast form is affected by the Light Armor skill and will be increased by the Agile Defender perk. Werewolf howls count as shouts for the purposes of the General Statistics screen; each time you howl adds to your total number of shouts and it is possible for a howl to show up as your favorite shout. Transforming into a werewolf in view of the guards of a Hold is a handy way to quickly achieve the Master Criminal achievement. Though the character model for beast form werewolves is the same regardless of gender, males are taller than females. Game data sets the height scale at 1 for females and 1.13 for males. Full Moon Rising is in game data as a constant effect that enhances stats while the moons are full; however, it does not actually appear in normal gameplay. The Fear shouts are not affected by the Master of the Mind perk. Time still passes while the perk tree is displayed (though nothing moves outside of the menu). If you take too long perusing the perk tree, your Beast Form might wear off and you won't be able to select one. As soon as you close the menu, you'll immediately change back. You'll need to transform again in order to access the skill tree and select your new perk. The Dragonborn add-on adds werebears, a new type of lycanthrope. However players cannot transform into these creatures. The werewolf perk tree was originally developed as part of the Game Jam. While you can't initiate conversation in beast form, most scripted conversations (like running into Eisa Blackthorn which starts The Pale Lady quest) will still happen, and the NPC will converse with you like normal. Using the special ability of the Ring of Namira to feed on a corpse will make it impossible to feed on it in beast form. The reverse is also true, corpses fed on in beast form cannot be cannibalized with the Ring of Namira. It is not necessary to kill an enemy while in beast form in order to feed on the corpse. Enemies can be killed in humanoid form, then you can transform into a werewolf to feed. This makes it possible to clear a location in humanoid form, then transform and feed on many corpses at once without engaging in combat. The Totem of the Predator perk grants a modified "Detect Life" ability: it 'paints' all targets in the area affected by the howl. 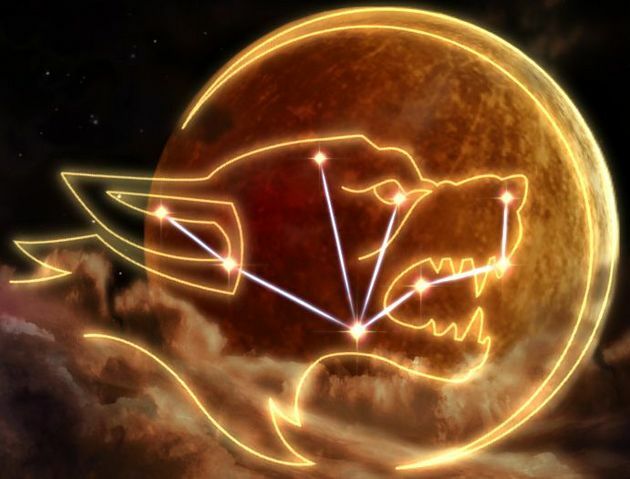 Said effect lasts for one minute, even if the target(s) leave the howl radius, though new targets entering the range are not affected until the howl is repeated. As well as being unable to interact with certain objects, you are also unable to destroy spiderweb barriers while in beast form as attacks seem to go straight through. This can make it difficult to progress though certain locations where spiders reside. Transforming back to human form will allow you to destroy the barrier and proceed. You are unable to breathe underwater as a werewolf, even if you are an Argonian. In Survival Mode, your Beast Blood will prevent you from having the Rested or Well Rested bonus. However, after a full sleep it takes the same amount of time for your Fatigue to fall to Drained as a non-werewolf from a Well Rested state. NPCs may still make mention of your "wolfish grin" or the "fur growing out of your ears" or "you smell like a wet dog" even after you are cured of lycanthropy, because the only condition for these remarks is the completion of The Silver Hand, not your werewolf status. Similarly, in the statistics section of the menu, the "days as a werewolf" statistic may continue to increase even after lycanthropy is cured. This bug is fixed by version 1.2.2 of the Unofficial Skyrim Patch..
You can input set playeriswerewolf 0 to the console to fix the statistic increase but not the NPC comments. The 100% disease immunity does not prevent contracting diseases from traps due to a script oversight. Using Soul Trap on a corpse you have already eaten as a werewolf gives you another heart from the victim. You can progress werewolf perks, but you have to wait to transform again to actually unlock them. Savage Feeding benefits from this bug as well. Sometimes equipment is not fully removed after transforming. If you retain a weapon after transforming, this can cause you to be unable to attack with the weapon-equipped hand and causes strange animations, since werewolves do not have animations for wielding weapons. You may be unable to cure yourself using the blue flame immediately after curing Kodlak in the Companions quest line. This may be fixed by doing radiant quests for the Companions until a Purity mission comes up, after which you can use the flame again. You may need to complete both Purity quests (for both Farkas and Vilkas) before you can cure yourself. Right before you turn back into a human after using Beast Form, you may get a message saying that you are over encumbered, and you may be unable to run or sprint, even though you aren't. Opening your inventory and closing it again may fix this. After reverting back to human form, the forced third-person camera sometimes persists. Interrupting the feeding animation (such as by howling) will successfully complete the feeding immediately. While in werewolf form, it is possible to get stuck in it well over the time limit. This can be fixed by using the wait function for 24 in-game hours, though this might not always work. It may work best if you wait multiple one hour periods than just one 24 hour period. When transforming into a werewolf, there is a brief period between when the cutscene ends, and when you regain the ability to move and attack. If you feed on a corpse in this narrow window of time, the werewolf transformation may be very short (a few seconds). Using this glitch in combination with the Ring of Hircine allows you to make several kills and feed on the corpses one by one for skill tree progress, without having to remain in beast form for a long time afterward (and without having to wait). Sometimes while in beast form, the sprinting power attack may not execute despite holding the sprinting and attack buttons. Exiting and reentering sprint mode usually fixes this. Sometimes, when reverting back to human form, part of the werewolf skin will form over your equipment. The werewolf head will have no teeth, and will clip into your first-person view. Despite the fact that powers are inactive, the Orcs can activate Berserker Rage before transforming, thus allowing their attack damage to be doubled ? For more information about lycanthropes of the Elder Scrolls universe, see the lore article. This page was last modified on 13 March 2019, at 01:05.